Deutsch, Harold, and Dennis Showalter (eds.). What If? Strategic Alternatives of WWII . Emperor's Press 1997. Showalter, Dennis, and Harold Deustch (eds.). 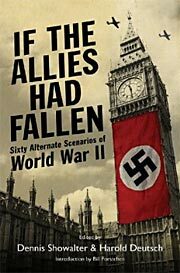 If the Allies Had Fallen: Sixty Alternate Scenarios of World War II . Skyhorse 2010. Summary: Collection of numerous short scenarios by historians, considering such questions as what if World War II had begun in September 1938, if Britain had sued for peace in 1940, if the Japanese had launched another strike against Pearl Harbor, if Hitler had stayed out of military decision making, and if there had been no atomic bomb. Includes work by Thomas M. Barker, Harold C. Deutsch, Walter S. Dunn, Robert M. Love, D. Clayton James, Bernard C. Nalty, Richard J. Overy, Paul Schratz, Dennis E. Showalter, Gerhard L. Weinberg, Anne Wells, and Herman S. Wolk. Comments: The volume is chronologically organized in 12 chapters written by each contributor, with each chapter discussing several alternative scenarios during the particular time period. The 2010 and later editions include a foreword by William Forstchen. Published: As What If? 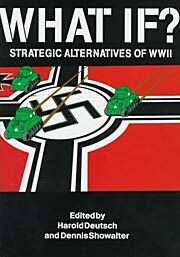 Strategic Alternatives of WWII , Emperor's Press 1997 (1883476070BUY). Published: As If the Allies Had Fallen (as edited by Showalter and Deutsch), Skyhorse 2010 (1616080272BUY), 2012 (1616085460BUY); Frontline 2010 (1848325665BUY), 2012 (1848326564BUY). Translation: Swedish by Göran Andolf as Om Tyskland segrat — 53 alternativa scenarier , Fischer 2011 (9789186597153).